Are you looking for a Couple and Marriage Therapist? Do you want to deepen your love relationship? Are you finding it increasingly difficult to talk to your teenage children? Are they becoming strangers? Do feelings of anxiety and stress or grief and depression affect your relationships, your work or your performance? Do you feel exhausted, down, lonely, misunderstood, lost, trapped or angry? Difficult relationships, as well as high expectations of ourselves and others, often lead to feelings of frustration, anxiety, stress and extreme loneliness. My clients are couples who are facing difficulties in their relationships or individuals who may be experiencing various anxiety disorders, depression, grief, loss or low self-esteem. When I work with couples, I help them create stronger emotional connections for better communication and closeness. I am a trained Emotionally Focused Couple Therapist and help couples understand and challenge the negative dance they are in. Together we find ways to re-create the connection couples are deeply craving. As a Psychotherapist, I specialize in helping individuals understand and manage feelings of anxiety, stress, depression and grief. Clients learn to reconnect with their strengths and regain control of their life. My extensive training in Emotionally Focused Therapy, Psychotherapy, Clinical Hypnotherapy, BrainWorking Recursive Therapy®, Counselling and Life Coaching allows me, during our initial consultation, to discuss the therapy plan best suited to your own individual needs. My work is non-judgmental, caring, professional and totally confidential. I work in both English and French. I see clients face-to-face at my private office in Dubai or on Skype worldwide. You can contact me, give me call me on +971 55 732 99 66 or send me an email to evelyne@evelynelthomas.com and we can discuss your situation. 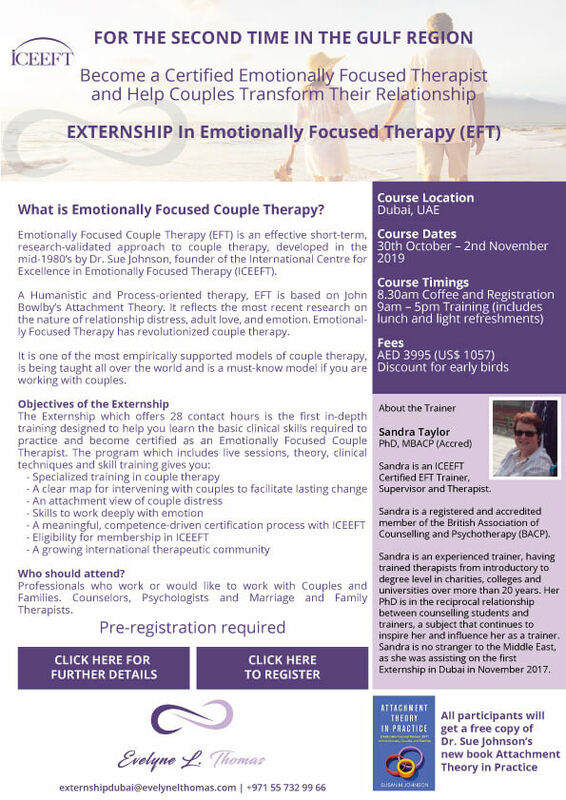 The Externship which offers 28 contact hours is the first in-depth training designed to help you learn the basic clinical skills required to practice and become certified as an Emotionally Focused Couple Therapist.